Peppers and Carrots -- a Healthy Snack? Food & Drink > Peppers and Carrots -- a Healthy Snack? For years I have kept a plant pot on the window sill in my kitchen and anytime I cut something that had seeds I would throw some of the seeds in the pot. 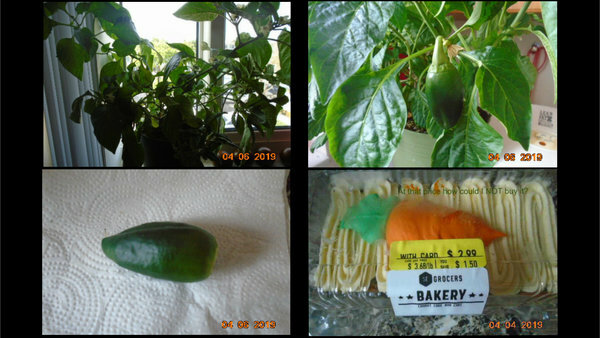 I have, over the years, had some results from tomato, cucumber, pepper seeds. I say some because I usually get blossoms but not vegetables. In fact I have given plants to people who have gardens in hopes they would have better results. Imagine my smiles when, the other morning, I saw a fully formed pepper on one of the plants! Naturally I had to cook it with my dinner last night--next one I'll cut up and put in my salad--if there is a next one!! Now regarding carrorts--we know they are healthy for you and are so walnuts and you need vitamin D and calcium from the cream cheese so all in all carrot cake supplies you with all the necessary nutrition---besides at that price--$2.99 how could I not buy all that health?!?!? I'm serious! The peppers with the four humps on the bottom are female and best for eating raw--sweeter. The male has three humps and is best for cooking. I don't discriminate--I eat and/or cook with both!